The arrival of Sirajul Haq as the fifth emir of the Jamaat-i-Islami (JI) is being interpreted variously. Most commonly, however, it is being viewed as the restoration in the Jamaat of the Qazi Hussain Ahmed strain of populist politics fired by a strong desire to evolve into a mainstream political party. “Sirajul Haq will follow Qazi Hussain’s style of leadership,” one of the top Jamaat leaders from Lahore told Dawn. Speaking on the condition of anonymity because of party discipline, he said: “He will prove to be more accommodating [in forging alliances with other parties] and avoid controversies because of his experience of working in the coalition government of the MMA [from 2002 to 07] and now with the PTI in Khyber Pakhtunkhwa.”The election of a JI emir has always attracted considerable public interest because of the political ideology it represents and the street power it is supposed to wield, even though the JI has never succeeded in attracting voters to itself. The results have always been predictable, until Haq sprang this surprise. He emerged as the winner on Sunday as the Jamaat Arakeen (members with voting rights) voted out the sitting emir, Syed Munawwar Hasan, for the first time in the party’s history. If this was not significant enough, he defeated another JI stalwart, Liaquat Baloch, a bit of a pragmatist politician himself with his own constant appeal, particularly in Punjab. There are two points that need to be discussed. One, how is that the Jamaat broke away with its tradition of never voting out a sitting emir, even if it was accepted that Hasan was a somewhat reluctant candidate for re-election? And, two, if the fight effectively was between two more pragmatic, relatively young contestants in Haq and Baloch, how did the Jamaat members distinguish one from the other? The answers to these questions can be found in the Jamaat’s politics under Hasan who has always been more of an ideologue in the party. It was quite clear that his style of politics created a craving for a return to the days of his predecessor. This is where leaders such as Baloch and Haq emerged as his likely heirs. It was to a large extent Hasan’s own preferences of partners — which saw the Jamaat allying itself with the PTI in Khyber Pakhtunkhwa — that could have given Haq an edge over Baloch. He obviously was referring to the sitting emir’s statement declaring TTP leader Hakimullah Mehsud, who was killed in a drone strike, a martyr. He didn’t stop there and argued that if an American who died on the battlefield was not a martyr how could those from among the Pakistan army fighting [the American war] be termed as martyrs. The statement had drawn a strong response from the army, which had called for an unconditional apology from the JI emir for hurting the feelings of the families of the thousands of Pakistani soldiers who had laid down their lives fighting the terrorists. Though the Jamaat defended its leader after the army condemned his remarks, it distanced itself from his statement by saying it represented Hasan’s “personal views”. The anonymous Jamaat leader agreed with Dr Rizvi. “Syed Munawwar listened more to his heart. The kind of statements he has given in support of the Taliban didn’t represent the party’s stated policy or its culture. We do not have a soft corner for the Taliban. Our party has never favoured militancy. So when they got a chance, our Arakeen gave their decision [against him],” he argued. While Farid Paracha, another top Jamaat leader from Lahore, agreed that the new JI emir would bring the same ‘concept of change’ as was brought in the party by Qazi Hussain whose protégé Haq is, he rejected ‘speculation’ that the Arakeen had punished Hasan for his controversial statement. 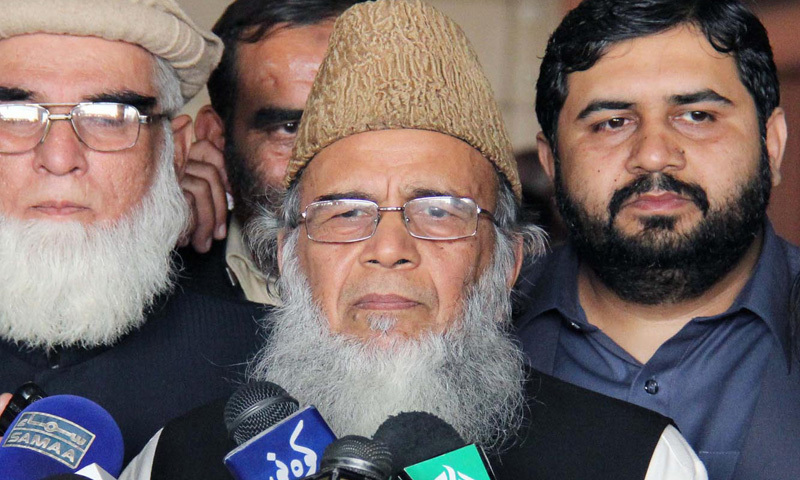 “Syed Munawar, who is 73 years old and has some health issues, was reluctant to lead the party for another term. The Markazi Shoora turned down his request but the party Arakeen accepted it by electing a new emir.” He was hopeful that Haq’s election would revitalise the party and its workers. The JI emir-elect has a public perception of being a hardliner and sympathetic to the militants. Yet both the Jamaat leaders and analysts reject this view about him. “Contrary to his public perception of being a hardliner, Sirajul Haq is a moderate [politician] in the old tradition of the Jamaat,” the anonymous JI leader contended. While Haq’s victory is seen as a return in the Jamaat of a politically more accommodative era, the defeat of Baloch is being seen as consolidation of the forces in the party that want alliances with political forces like the PTI that are “ideologically more compatible”. “Baloch represents the Punjab party that is more inclined towards forging an alliance with the PML-N. This stance was rejected when Syed Munawwar refused to make electoral adjustments with the PML-N in last year’s elections and chose the PTI over it. The election of Siraj has consolidated that political outlook further,” said a senior journalist who also refused to give his name. Thus Hasan may be gone, one of his legacies will survive, at least for the time being.